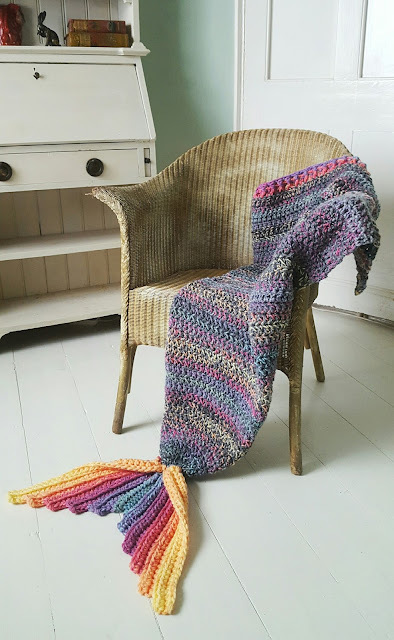 Any of you who follow me on Instagram will have seen my mermaid tails. I have been busy making them over the summer and selling them at Croyde Craft Market. Every time I would post a photo, I would get lots of requests for the pattern. I have been so busy over the summer that all I could do was try to help people as best I could with encouraging them to make their own version and apologising for only having the pattern in my head. As I was reaching the end of my run of summer markets, I was chatting to some lovely ladies who were on holiday about the tails. One of them (I forget their names sorry!) ran a yarn shop and also taught crochet. We were talking about how people were requesting the pattern and they pointed out that I can only make so many tails … it wasn’t physically possible for me to make tails for all the people who were asking! They also talked about how it was only a matter of time before my design would be inevitably ripped off and how others would profit from my hard work. They mentioned how one of the ladies had made a cocoon blanket and within weeks, someone else had made one based from her pictures and was now selling the pattern. Encouraged by their words and heeding their advice, I decided to make the leap and sort out the pattern! It is available for sale as a digital download on Etsy, Ravelry and my website in either USA terms or UK stitch terms. 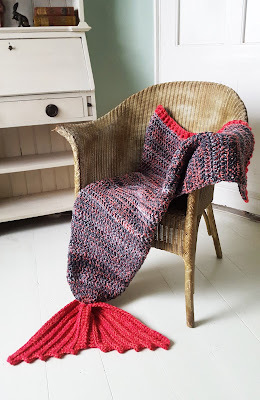 I have been receiving wonderful feedback about my pattern and I’m now starting to see photographs of tails made from my pattern trickling out – it is SO exciting! 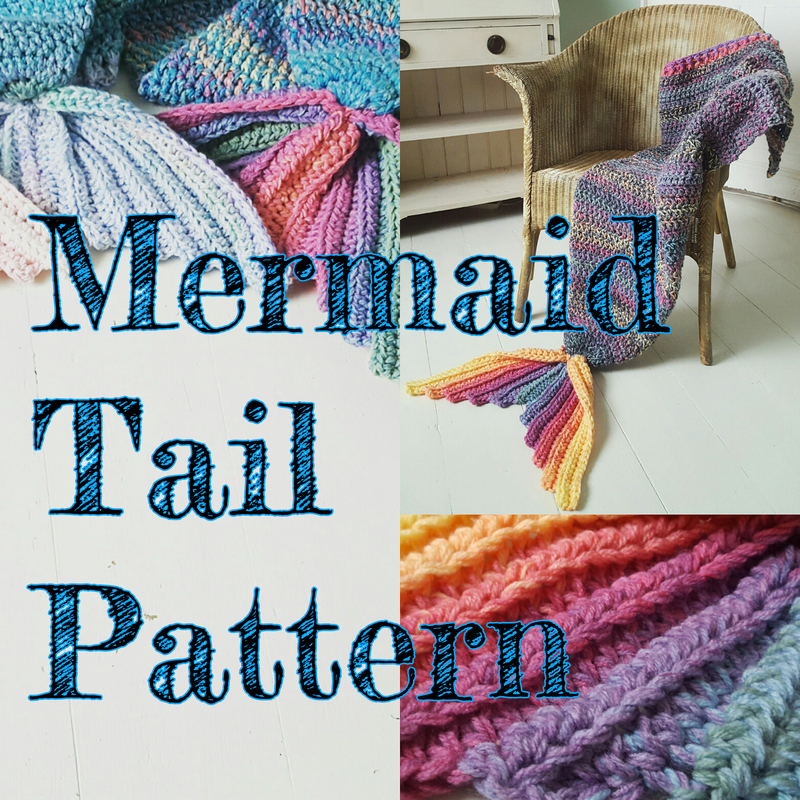 I can’t tell you how much I love seeing the tails made from my pattern! Is this a full sleeping bag blanket? No! It is a snuggly pouch for your feet then splits at the back to be a traditional lap blanket. It is open at the back which means you can get in and out of it very easily! Do you have a child sized version of the pattern? No, there is no need! The blanket pattern is super flexible, if you require a smaller tail you can simply omit the last rows – once the shaping is done for the foot pouch, you only need complete the rows that take your blanket to the desired length. It is worked from the bottom up so is easy to tweak to suit your needs. 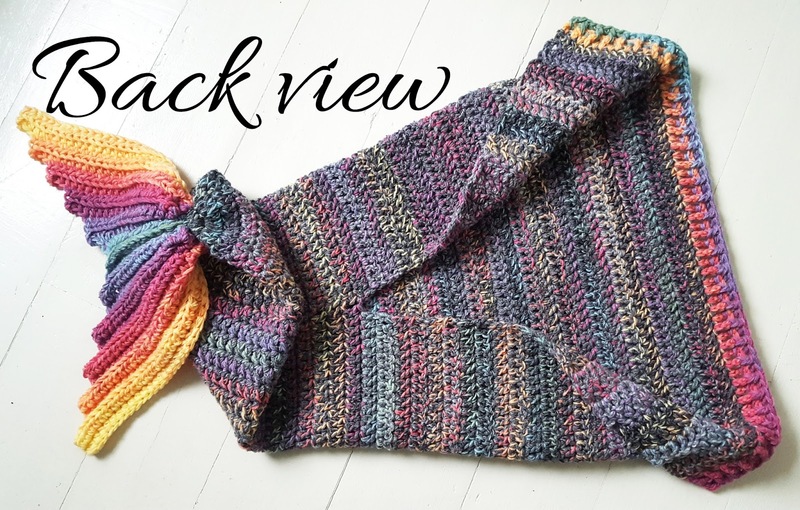 Do you have a larger adult sized version of the pattern? Again, no need! 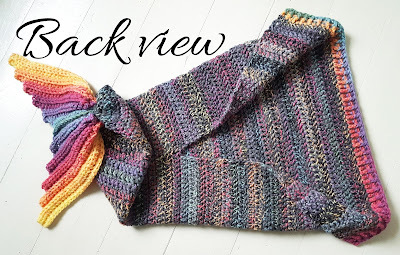 The foot pouch section of the pattern is a one size fits all – the blanket section is easy to make longer, wider or both! Do I have to use the recommended yarn weights? No! 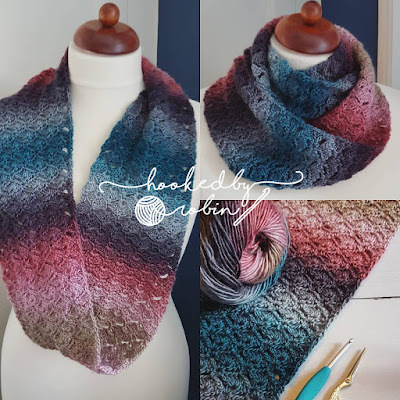 The pattern calls for one strand of chunky yarn (the USA equivalent of UK chunky is Bulky) and two strands of double knit yarn to be held at the same time. These recommended yarn weights make for a nice, dense heavy textured blanket. The pattern is not gauge specific so if you don’t want such a thick fabric, use less strands or substitute the yarn weights. You can mix it up however you want! The only important thing is the hook size. 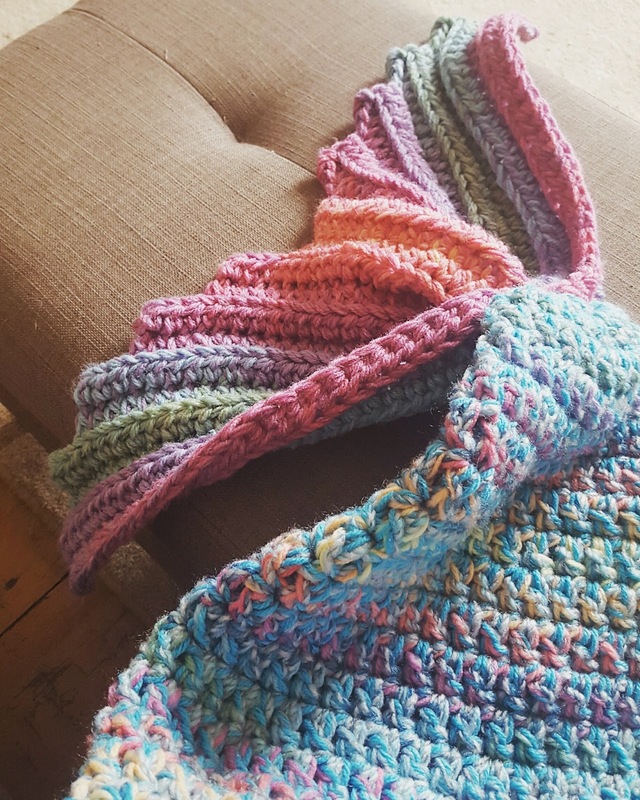 If you use less strands or finer yarns, you will have a lighter blanket. My advice to everybody is grab whatever yarn you fancy, have a play with the first couple of rows and see how the blanket works up. 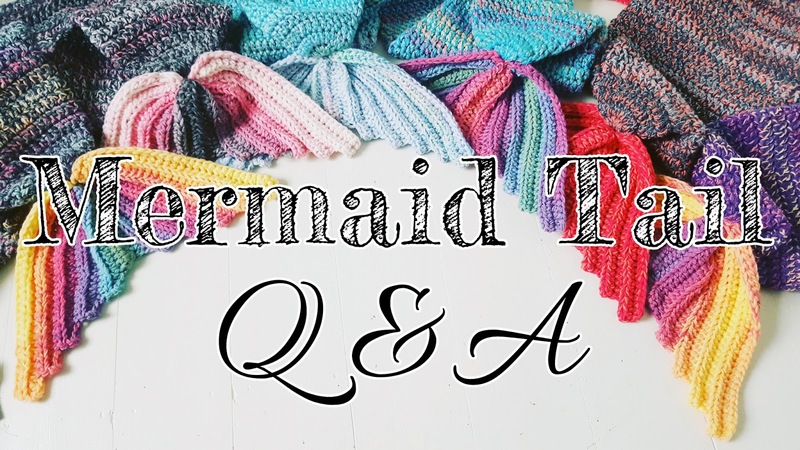 What yarn do you use? All sorts! I raid my embarrassingly large stash of yarn and play with colour. I spend more time concentrating on my colour choices than I do the yarn brands. Mix and match to suit your taste! 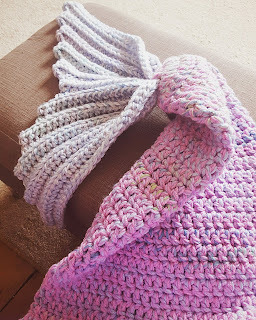 The mermaid tail I made for the pattern itself uses one strand of James Brett Chunky and 2 strands of Stylecraft DK. I do recommend however that you use 100% acrylic yarn so your tails are fully machine washable. 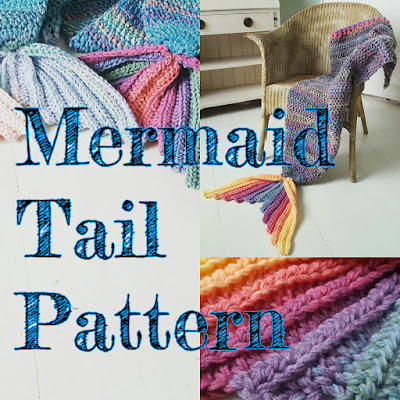 Can I sell the mermaid tail I make from your pattern? A little credit to me the designer is always appreciated but not obligatory.